The acute thrombosis of the central retinal vein at the level of the lamina cribosa resulting from local structural factors (i.e. atherosclerosis of the central retinal artery) or occlusion from intraocular inflammation is suspected to play a role in the pathogenesis of central retinal vein occlusion (CRVO) . Occlusion of the central retinal vein results in hypoxia and upregulation of proinflammatory mediators and vascular endothelial growth factor (VEGF) . 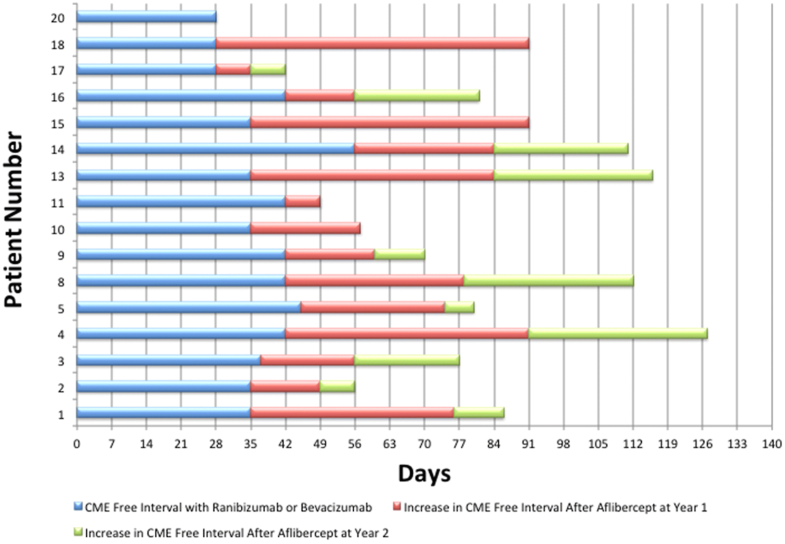 Inhibition of VEGF by intravitreal medications (ranibizumab (Lucentis; Genenetch, South San Francisco, CA), bevacizumab (Avastin; Genentech, South San Francisco, CA) and aflibercept (Eylea; Regeneron Pharmaceuticals, Tarrytown, NY) and intravitreal corticosteroids are effective for the treatment of macular edema associated with CRVOs but the primary endpoint in those clinical trials was only at 6 months [3–6]. Long-term follow-up of these patients revealed that the macular edema associated with CRVO requires chronic treatment beyond 6 months [7–10]. Through 4 years of follow-up in the RETAIN study, 56% of CRVO patients still required anti-VEGF injections to treat recurrent edema (every 2 months) and in those patients the mean number of injections was 28.4. Even though the recurrent edema resolved with treatment, there was macular damage due to recurrent edema and these patients had a guarded visual prognosis . An alternative management strategy to PRN in the long-term management of macular edema secondary to CRVOs is TAE. It is the most common regimen utilized by > 70% of retinal specialists in the United States in 2017 . The efficacy of TAE dosing for anti-VEGF therapy was first demonstrated in the treatment of neovascular age-related macular degeneration [15–17]. By proactively treating these patients at each visit using an individualized dosing interval approach, the goal is to minimize the recurrences of CME that could lead to irreversible vision loss with PRN dosing regimens while decreasing the treatment burden with extended visit intervals as compared to monthly treatment. The Study of Comparative Treatments for Retinal Vein Occlusion 2 (SCORE2) trial compared aflibercept and bevacizumab TAE dosing with monthly dosing for the following 6 months after the initial 6 month fixed dosing period in patients who demonstrated a good response at month 6. There was an average of 1 to 2 fewer injections in TAE compared with monthly but due to the wide confidence intervals on the visual acuity differences between the two regimens, caution was advised before concluding that TAE and monthly dosing outcomes are the same .